J.R. Schnelzer is an active professional photographer working in the areas of fine art collector prints, portraiture, nature and photographic illustration. He is co-owner of WesternExposure and the Colorado School of Photography. 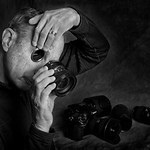 J.R. has over 40 years of experience in the photographic arts, winning his first national award in 1963. Since then he has won numerous awards and distinctions including the prestigious Nature Conservancy photo contest. His images have been published internationally and exhibited in galleries across the country. “Photography is the process of creating future memories. My work is my language: I view things in terms of their form and beautiful light. The hope of my art is to hold for you, in the subsiding of life’s rush, the beauty of visual moments”.